Who’s got their chunky sweater and boots on and is loving this fall weather?? This girl! 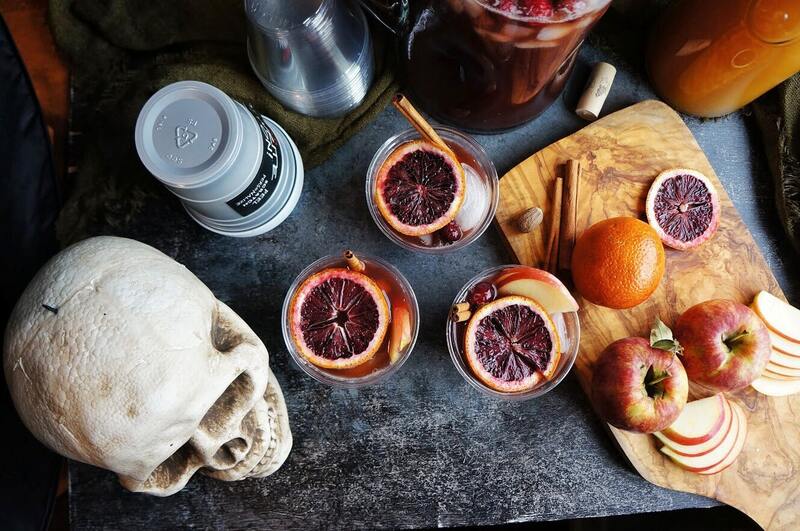 I’m already planning my Halloween parties and all the yummy dishes that will be on a festive fall tablescape. 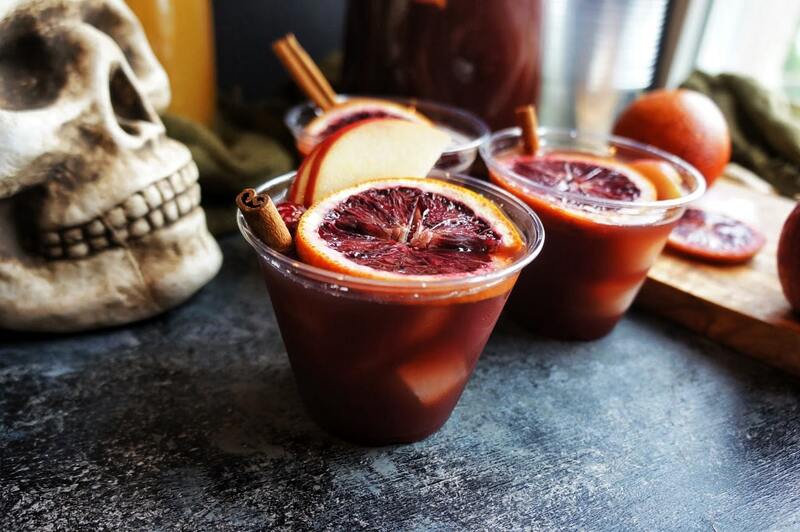 I’ve teamed up with Solo to show you how to make a Halloween sangria for your October 31st costume party that all your guests will love! 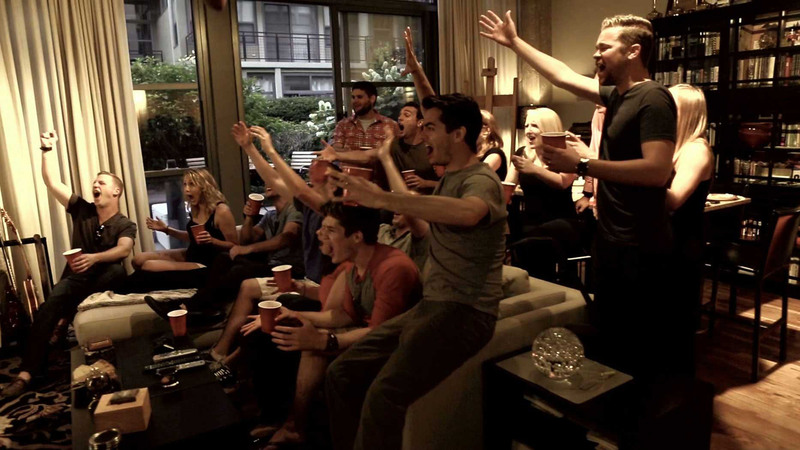 Maybe you’re planning a Spooky Halloween party or Friendsgiving this year, or you’re just gathering with friends to celebrate on a Friday. 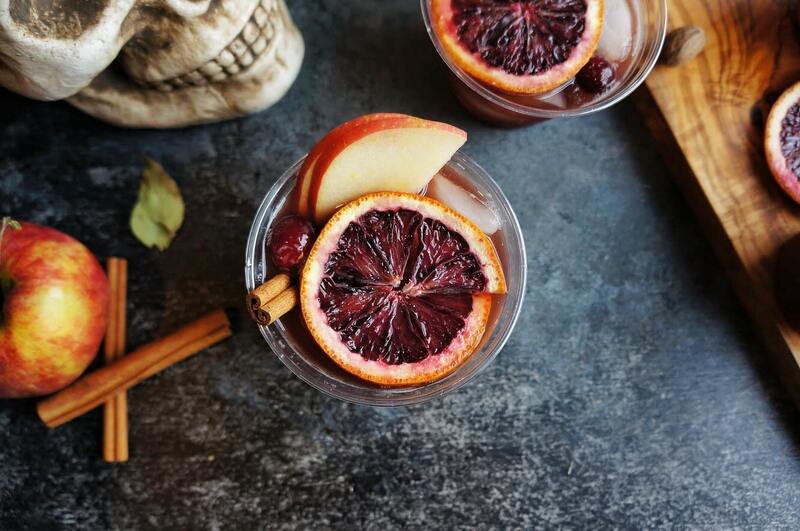 Whatever the grand or small occasion, this Halloween sangria is the perfect cocktail for this fall season. What are the ingredients in Sangria? 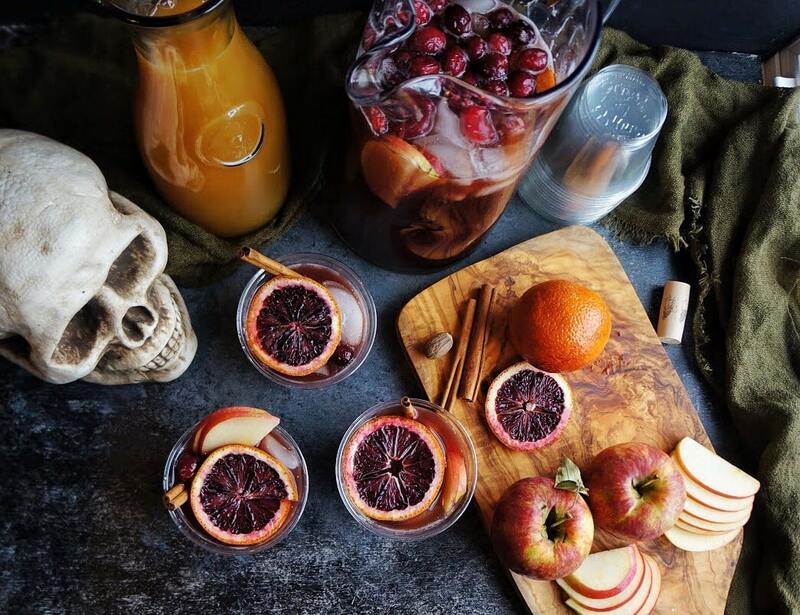 This Halloween sangria incorporates lots of fresh fall fruits (think crispy apples and blood oranges) and was inspired by my moody Halloween tablescape I created with some thrift store finds. A fall spiced simple syrup gives it the perfect warm flavors for the season! What is the best red wine to use for sangria? Choosing the variety of red wine for your sangria will determine what fruits you put in your pitcher. Merlot is generally fruity and round, with a soft body. I love to add flavors like vanilla, dried fig, and pears when I use Merlot in sangria. Cabernet Sauvignonis often a wine with a bigger flavor with aromas of cassis (blackcurrent) and blackberry. It has lots of cocoa notes and roasted coffee. For this Halloween sangria, I chose a pinot noir, which was super affordable and a lighter choice of red wine that is filled with fruity notes that were perfect for my menu. I added a flavor infused simple syrup to this sangria to bring out all the fall flavors that I love: cinnamon, nutmeg and cloves. I used Solo’s 9 oz clear plastic cups to serve this gorgeously colored sangria. I love the blood red color of the oranges and the deep color of the sangria and I felt like it was perfect for this spooky occasion. 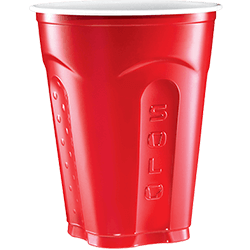 For the kids at your party, you can serve leftover apple cider from the sangria in Solo’s write on plastic cups. They’re perfect for including your costume name on each drink to keep track of their apple ciders. 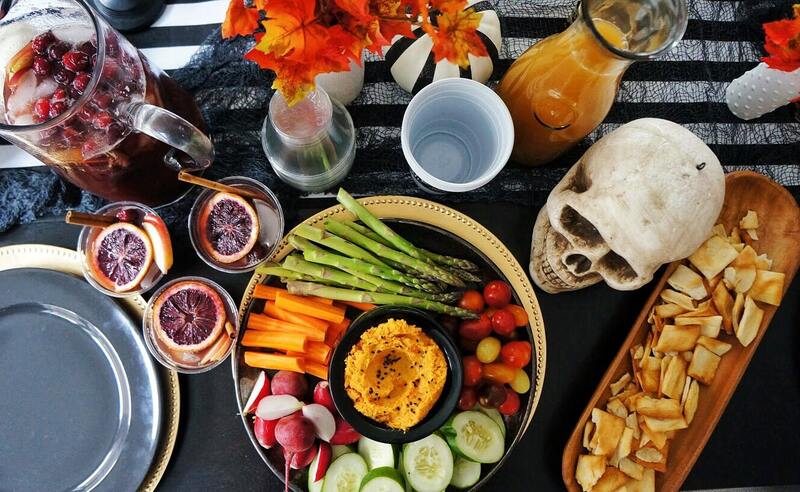 My fall tablescape is complete with a skull head I found at Michaels, this black and white striped table runner draped with a black gauze cloth. I filled the vases with faux fall leaves and scattered black and white pumpkins around the table. Do you have your Halloween costume planned? Whatever you dress as, be sure to celebrate safely! In a small saucepan, whisk together the water, sugar, cinnamon stick, nutmeg and cloves. Bring to a boil and boil for 2-3 minutes or until the sugar has dissolved. Remove from the heat. In a large pitcher, combine the red wine and apple cider. Stir in the simple syrup mixture, apples, oranges, and cinnamon sticks. Refrigerate for at least 4 hours, preferably overnight, before serving over ice.